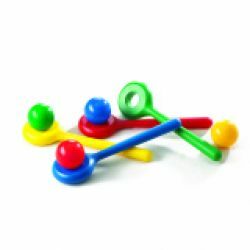 A great tool for teaching important skills such as balance and hand-eye coordination. As kids gain confidence in their abilities, so will the distance they are able to walk while balancing the ball. A great self-esteem booster! Includes 4 wands and 4 balls in assorted colors. Includes 4 wands (34cm each), 4 (70mm) balls in 4 colors. Ages 3 and up.